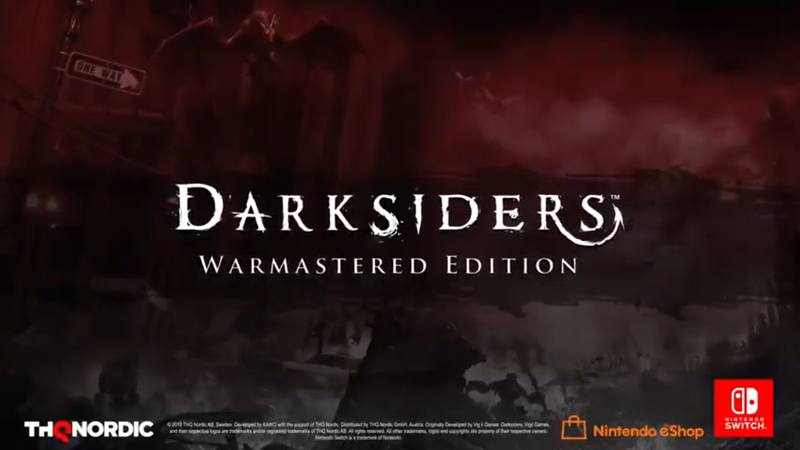 Well folks, THQ Nordic have finally revealed (officially) that Darksiders Warmastered Edition is coming to the Nintendo Switch. The Darksiders Warmastered Edition For Switch will recieve both a physical and digital release on April 2nd and is priced at €29.99. We have the official PR for the game below. WAR… WAR never changes his platform. Or does he? Vienna, Austria and Austin, Texas, January 31st, 2019 – Ruin is ready to stomp on Earth again, when War, the devastating and disputed hero of Darksiders Warmastered Edition, starts the Apocalypse on Nintendo Switch. When will this happen? April 2nd is the planned release date for the End Of The World as we know it: a world without Darksiders on Switch™. Darksiders Warmastered Edition is already available for PC, PlayStation®4 and the Xbox One family of devices including Xbox One X, and will be out on Nintendo Switch™ on April 2nd 2019 for an SRP of £25.99 / €29.99 / $ 29.99, both digitally and in retail stores.